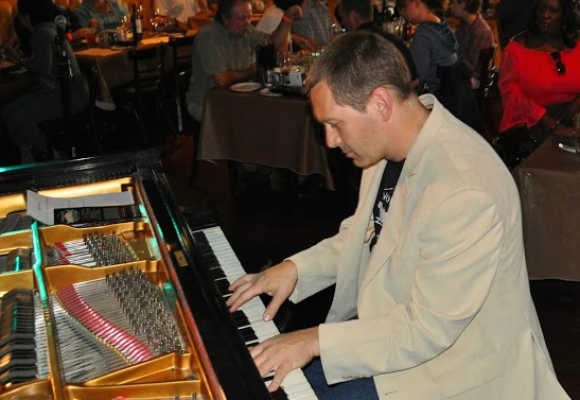 Danny plays piano with his trio every Sunday at Piccola Cellars in North Bend, Washington and he has three CD’s on the Pony Boy Records label. His most recent CD, “Danny Kolke Trio +One Featuring Pete Christlieb”, add’s Pete’s amazing Tenor sound to the dynamic group. It’s a must have to any Jazz fan’s collection. In 2009, Danny founded Boxleys jazz club, clearly the “Best Jazz Club in North Bend Washington”. But Boxleys became known around the world, becoming ranked as one of the best Jazz clubs in the world according to Downbeat Magazine. Boxleys was an amazing and almost magical place from the day it opened until 2016 when they decided to close it’s doors. In 2010, Danny founded the Boxley Music Fund / JazzClubsNW, a nonprofit 501c3 based organization committed to helping support live music performance and Jazz education. It’s a membership based and member run organization. They pay the musicians and put on clinics and workshops, as well as organize Jazz & Blues festivals. The music fund has been around for more than 6 years now and is turning out to be a big success. Danny continues to serve on the board of the organization and volunteer at numerous events. If you aren’t a member yet, you should be. In 2012, Danny founded the North Bend Jazz Walk and in 2013, the North Bend Blues Walk. Both events feature local and regional artists performing in restaurants, a movie theatre, cafe’s, coffee shops, retail stores, car dealerships, etc. all turned into venues for the night. Hundreds of musicians have performed at these festivals and thousands upon thousands have attended over the last several years having a tremendous impact on the community and musicians. These festivals are still in operation and largely organized by volunteers. As a Technology Entrepreneur, Danny has had a long history in the area of software as a service and Web-based applications. Since founding Etelos in 1999 as a dotcom, he persisted in leading the organization for 16 years in various roles from founder to CEO, CXO and CTO. Danny worked with developers and businesses alike building and distributing Web-based software as a service. In 2007, Danny achieved recognition as one of the most influential people on the internet for writing CRM for Google, a web based contact management application that worked with Google Apps. From there his company grew substantially and Danny decided to step aside for a bit and let others run the company. The company went public, and eventually ran into trouble with the collapse of the stock market in 2008. Danny stepped back in as the CEO of the public company focused on doing a turnaround for the next 2 years. After 2 years of running a public company, Danny stepped aside again and served as CTO from 2010 until 2015. During those years the company successfully launched innovative solutions for distributing web applications throughout the America’s and Europe eventually changing it’s name to Cloudward, launching a new framework for deploying and customizing applications on Google’s Cloud platform. Etelos and Cloudward represent a tremendous experience over 16 years, working with great people and customers. However, Danny is no longer involved at this time. As an inventor, Danny is named on five patents plus an open source project for a programming language called EASE, the English Application Scripting Engine. The basic premise of EASE is to make it so anyone can create a web application with complex functionality, through writing code in conversational English and the framework will convert it into whatever needs to happen to make things just work. Danny, Etelos and Cloudward have written hundreds of applications in EASE including CRM for Google and many others. As a more recent example, If you had ever been into Boxleys, you probably notice that the servers take orders on their iPads. Well, that is an application written by Danny, in EASE, on his spare time. In 2016 Danny joined Microsoft as a senior consultant with Microsoft’s Premier Support for Developers organization where he is focused on helping large enterprises with their cloud strategy. Admittedly this is a big change from Entrepreneur to Consultant, but Danny is excited to support what Microsoft and their customers are doing in the cloud. As the son of a Baptist minister, Danny grew up playing music in church. When he was fourteen he became the regular church pianist developing a large repertoire of traditional hymns. He is still playing piano and leading worship music today at Cascade Covenant Church where he and his family now attend. Of course the music is more contemporary but he slips in some more traditional gospel riffs, traditional hymns and jazz chords when he can. So by day, Danny’s in the software business. And by night, he could be playing piano, writing music, working with students, or maybe building some cool web app or website. On a personal note Danny and his wife Robyn moved to North Bend 19+ years ago and love raising their three children Leslie, James and Daniel III in the Snoqualmie Valley. They all take music lessons, and play a variety of instruments, continuing in the musical tradition.